Remember in High School when you would worry about how well you would do on your tests, and how those scores would either make or break your college admissions and scholarships? It wasn’t the most relaxing thing to think about. Well now as adults we continue to be graded and assessed by our scores, only this time it’s not how well we do on tests, but how well we manage our finances. I am of course referring to the credit scoring system, and more specifically the FICO credit scoring system. For those accounting buffs out there, this acronym is not to be confused with the FIFO method of inventory management. For those non-accounting buffs (what do you mean you don’t like accounting?) please disregard my lame attempt at humor. If for whatever reason you are not aware of the FICO credit scoring system, then let me quickly explain. Credit scoring systems were created by lenders and other financial institutions as a way to grade risk. Basically they created mathematical logarithms (pretty neat stuff really) which take into account all of the data available on if you pay your loans on time, the ratio of your current debt to the debt available for your use, how often you apply for loans and credit and the length of time that you have had your loans and lines of credit. The FICO credit scoring system is used almost industry wide between lenders and other financial institutions. The FICO credit score can range between 300 to 850 points, with the median (meaning half over, and half under) FICO score of Americans being somewhere around 720 points. 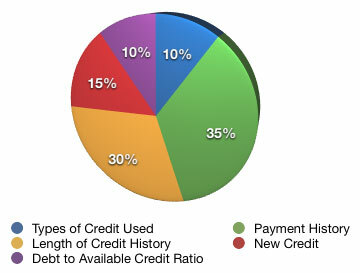 The FICO score is calculated and impacted by five different variables, which can be seen on the pie chart to the left. The Fair Isaac Company (the maker of the FICO credit scoring system) has disclosed the following components (as also seen on the pie chart) of its credit scoring system, and their approximate weights. How do they really use this stuff? Thanks to the Fair Credit Reporting Act companies must now inform consumers if they will be pulling their credit for any reason. Sometimes this is not made as clear as it should be, and often they do not want consumers to feel as if they have a choice, but such is not the case. However it is a fact that companies want to (and do) use your credit report and your score as a means to provide you with their products and services. For example most banks and other financial institutions will pull your credit when you open an account with them. This applies to savings accounts, checking accounts and then of course the obvious: loan applications. You should be made aware of this by your financial institutions, but things are not always done properly. Do you have Auto, Home or Renters insurance? Have you received a quote for one of these products recently? If so, then there is a very strong chance that the insurance company pulled your credit when they offered you a quote. Many insurance companies use the FICO credit score, some use it and an in-house proprietary scoring system, and some only use their own in-house scoring systems. Another use for the FICO (and other credit scoring systems) is for employers to screen potential employees. This is most common in careers where ethics and honesty are very important, for example any jobs in which you would handle cash or have any sort of security clearance to confidential information or items. These are the three most common reasons for your credit to be pulled, although there are others. You are now educated on how FICO scores are calculated and a few of the reasons they are checked. Now it is your time to shine; do all you can to keep your credit score above the median score and you’ll never have to worry about not qualifying for the lowest loan rate, being approved for that new checking account, receiving a lower insurance rate or not being hired for that brand new security job. Instead you’ll be proud of your financial accomplishments, and your A+ credit score. Why A Large Down Payment Isn’t Always Best, Take Two. Does A Large Down Payment Save Money In The Long Run? Thank you joseph, this was much needed. Actually i was looking something that can give me some idea about how credit score is calculated. And really, your does contain more than everything that i wanted to know. Thanks buddy. I’ve never thought much past the “pay them on time” scenario, but it is very interesting to see a rating broken down into its sub-components. Thanks! Great post! That is the most comprehensive outline of what a credit score is that I’ve ever seen. By the way, my credit is about 760 right now, any idea how exactly to get it to over 800? What stinks is when you have a low or no credit score because you don’t have debt, but are still a responsible person. Many companies don’t care and write you off. This “I love debt” score is not always the best indicator of risk, but it has become an industry standard for everything. Good explanation of how it all works, most people probably have no idea. Great Post. I guess, the best thing you can do to manage your credit score is to maintain a credit score chart. No cards are easy to get approved for anymore. Consumer credit lines have now been cut by over $2.5 Trillion (last week’s figures, thru end-July). Credit lines are being reduced or eliminated entirely. New credit is not being extended unless you have excellent credit. If you can get a new credit card application approved, the amount of the credit limit will depend on your income and amount of credit currently available to you. Never seen such cool post. I read it all the way to the end. Keep them coming. Captivating. May I add your blog to my link exchange directory? You obviously put a large amount of effort into that post and it really is exceptionally fascinating to see the idea strategy that you gone through to arise with those assumption. Many thanks for that. Well, I think that clears up a few challenges for me. How about anyone else? I never knew it works like this before reading this post. But which country does it apply directly, US only, or Canada too?